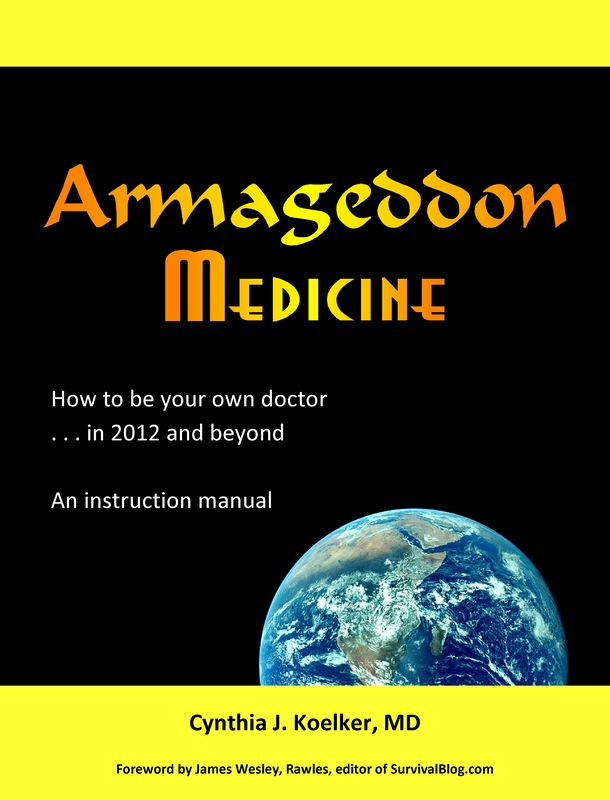 ← Armageddon Medicine – What’s in the book? Are you ready for ridicule? A few days ago I did a radio interview for a drive-time morning radio station. Each time I do an interview I learn a thing or two. This time the lesson was ridicule. It reminds me of Noah and his family, preparing for the flood. He must have been a good-humored man to put up with the taunts he received. I’ve thought about Noah a lot. Being the best man around, he must have been kind, likely intelligent, thoughtful, wise, loving, and cheerful. (Who wouldn’t want a man like that?) And I’m guessing he knew a lot about ridicule. It’s not the first time I’ve made the mistake of thinking someone was genuinely interested in the topic of personal preparedness. All he really wanted was to prove me a nut-case. I told him I was in Mensa. He responded, “Don’t you think there are kooks in Mensa?” But he had no facts to counter my argument. Recently I was talking with a 20-something relative of mine. I used the phrase, “The hand writing is on the wall.” I think he got the gist of what I meant, but then I wondered, did he understand the origin of the phrase? Another day I was talking about the 7 years Joseph helped Egypt prepare for the prophesied famine, comparing my own preparations to his. I was met with the answer, “But that was the government” – as if it is foolish to prep on one’s own. “Like sheep to the slaughter” popped into mind, but I kept quiet. When I discuss the economy, the non-preppers look at me as if of course it will right itself. But when I look at world history, I think otherwise. Are the “Doomsday Preppers” right or are they crazy? Am I? Are you? Tell me your stories of harassment or ridicule. What do you think is heading our way? This entry was posted in Slide show, Spiritual health and tagged Drive time, Egypt, Mensa, Mensa International, Noah, Radio, Radio broadcasting, United States. Bookmark the permalink. 10 Responses to Are you ready for ridicule? I hope to offer a glimmer of hope for you. I have been prepping for a couple of years now. At first, my family (husband and two kids, teen and pre-teen) made fun of me and laughed routinely. As the world events have evolved, my family has been paying attention. We have watched the Arab spring and the riots in Greece and Ireland and my family now realize Mom’s not crazy, just looking ahead. They are completely on board now and helping me prep. Your family will come around, too. I hope it occurs before TEOTWAWKI so they can help you prepare, too. I must live a somewhat sheltered life, because fortunately I have not had much ridicule. I work for a television ministry, and my boss and many of the volunteers – and some of my church’s co-workers – are preppers to one extent or another. I’m somewhere near the middle in that I’m preparing better than many, but I’m not nearly as extreme as some (one even has dozens of weapons and thousands of rounds of ammo buried on his property in case the government comes around to confiscate them). My wife sometimes wonders why I have 4 guns (“Isn’t one enough?” she says, and I say “4 isn’t really enough!”), and sometimes she’s critical of my efforts to support my family. She sometimes says I don’t do enough to help, while at the same time I’m planting fruit trees and maintaining the garden, stashing food and other supplies, and stockpiling medicines (including migraine meds for her son from her first marriage and special antibiotics for our penicillin-allergic daugter together). But at other times she’s supportive of my efforts and asks what else we can do to prepare. My son, on the other hand, just read “Alas, Babylon” in school and watched “The Stand”, so he’s completely up on the idea of prepping. We recently had a tornado pass through, and while we were hanging out in the basement storeroom we talked about what would happen if our house got hit. I pointed out all the water, food, sleeping bags, and other supplies in the room with us, and said we would be OK for a good while. I think the whole family came around to the idea of “prepping” at that point. For quite some time I was the guy at work who wore the tinfoil hat so to speak; it never bothered me, if I thought prepping was the right thing to do I was going to do it no matter what, and thats what I told people. Recently there has been a big change – numerous people are now seeking out my advice and giving me their emails, and telling me to send them articles of interest. Prepping is the new topic of conversation. Sometimes it just takes people awhile to come around and what I sense in a lot of people is a genuine sense of fear. They’ve come to realize they’ve wasted a lot of time and had better get up to speed but quick. I took your book Armageddon Medicine to work when I first got it. I was very anxious to look through it as soon as possible. A fellow co-worker got ahold of it and I didn’t think I would get it back! we’re still discussing medical care post any type of collapse. Several family members are learning to use weapons; one friend is now raising chickens and put in a good size garden. People wake up one at a time. Thank you for your thoughts as I have been dealing with the ridicule for awhile now. The bad thing is that it comes from my husband and my daughter. I have the canners, water filters, food storage, guns and ammo. I take all of their jokes and jabs in stride because I do the prepping for my family. Jesus has put it on my heart to do these things and I will not be made to feel bad for doing them. I told my family that I will never say to them “I told you so.” I hope the day never comes that I will have to bite my tongue to keep from saying it. Stacy your words could have been written by me. The only word I would need to change is from daughter to son; otherwise your story is mine. I have learned to just make my preparations without talking a lot about them. When I need to make an expensive purchase I just talk to my husband and tell him what I plan to get and ask him when would it be a good time for me or do I need to ask for that as a gift (Birthday, Mother’s Day, etc..). I have learned that it doesn’t matter if they understand as long as they don’t stop me or get in my way. My husband loves eating out of the garden that I have learned to grow over the last couple of years. He enjoys grabbing a jar of (whatever) and taking that to work for lunch. He has learned that even if he doesn’t agree with my reasons for getting prepared it has benefits for him now. Did not know you were in the area I was born to. For all the ridicule you receive there is at least one person out there like me that you help. Your efforts are not in vain. I just wrote this really long post and my captioned was not validated. Not your fault. So I am going to keep this one short else it happens again. I received your book today and found myself justifying for investing in it and I should not have to feel that way. I even used your dedication of the book as an example. Even people that are semi-awake don’t want to go all the way in. Thanks for what you are doing. Wish I could attend you class. I did you know you are in the area I was born to. I have family near by. My fiance, an extremely intelligent woman and staunch conservative, is well aware of the country’s dire financial condition and growing police state. In fact, she writes her own blog and posts on the liberal websites to counter their idiotic positions. However, she thinks I am paranoid to be a prepper. She hopes for the best and refuses to face the reality because it makes her depressed. I wonder how many gentiles and Jews in Germany did the same thing during the rise of Hitler? She does not ridicule me though and she has finally come to accept my refusal to board an aircraft due to unconstitutional actions of the TSA. Beyond her and a friend at work I do not bother to discuss prepping since it’s not worth the effort and frustration. I do not suffers fools easily. At this juncture, if people are not cognizant of the numerous dangers we face and are not doing what they can to prepare for their own survival then they will pay the price with their freedom and maybe their lives. Living your life for yourself is better than living your life for everyone else.